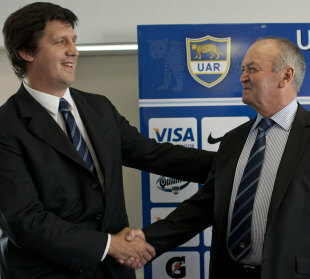 Santiago Phelan resigned as coach of the Argentine rugby team on Monday ending a five-year spell in charge. His departure leaves Argentina without a full-time coach on the eve of their three-Test tour of Europe. The 39-year-old, who guided the Pumas to the 2011 World Cup quarter-finals after succeeding Marcello Loffreda, had been widely expected to step down when his contract ended in December. Phelan, who will face the press later today, has just come off a Rugby Championship in which the Pumas lost all six of their games to New Zealand, South Africa and Australia in their second year in the four-nation tournament. He made his coaching debut in June 2008 against Scotland. Phelan enjoyed success as a player, being capped 44 times at flanker and playing all his club rugby for Club Athletico San Isidro.